As materials science advances, injection molding may give way to 3D printing—a strategy that’s widely used in design studios for pushing formal boundaries, but as yet not ubiquitous on the footwear market. 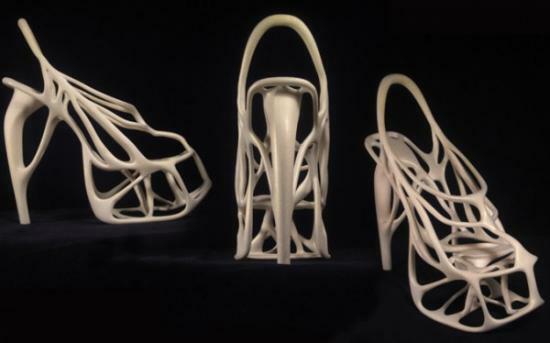 Most polymers used in 3D printers are too hard and inflexible to make a comfortable shoe, although fashion students and designers have not been deterred from producing them, if only for one lap down a runway. The existing concepts invariably look rather sci-fi, with web-like lines that wrap the foot. Swedish designer Naim Josefi envisions a consumer environment in which a shopper’s foot would be scanned in-store, and a shoe printed on demand that perfectly fit the wearer’s anatomy. Brazilian designer Andreia Chaves’s Invisible Shoe pairs a common leather pump with a 3D-printed cage-like bootie, while Dutch fashion designer Pauline van Dongen’s Morphogenesis shoe more closely resembles a platform wedge. And at the London College of Fashion, student Hoon Chung created a line of 3D printed shoes for a final project, which look perhaps the closest to contemporary styles, though the molded shapes betray a high-tech production method.